BROWARD COUNTY, FL - The Port Everglades Navigation Improvements Project has received federal authorization for the U.S. Army Corps of Engineers to move forward with deepening and widening the Port&apos;s navigation channels as part of the Water Infrastructure Improvements for the Nation (WIIN) Act signed into law December 16, 2016, by President Barack Obama. The project is currently in the preconstruction engineering and design phase, and can now proceed through the permitting and federal funding processes. The project is anticipated to create an estimated 2,200 construction jobs and nearly 1,500 permanent direct jobs locally resulting from additional cargo capacity. The Broward County Congressional Delegation joined local leaders today at Port Everglades to commend progress on the seaport&apos;s project. "My fellow commissioners and I want to thank our Congressional Delegation for their support in passing legislation that will allow two long-term Broward County water resource projects to move forward - the Port Everglades Navigation Improvements Project and the Central Everglades Planning Project," said Broward County Mayor Barbara Sharief. "Both projects are vital for our community&apos;s well-being and economic stability." 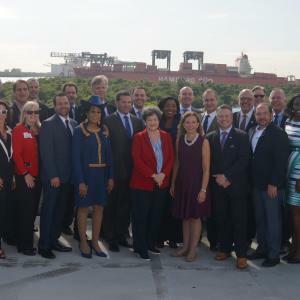 "This is a bi-partisan effort to make our navigation channels safer, globally competitive and environmentally progressive," said Port Everglades Chief Executive & Port Director Steven Cernak. "I applaud our Congressional Delegation for making this project a priority and recognizing the needs of our community." "The WIIN Act is a victory for South Florida&apos;s economy, giving the green light to federal funding for the Port Everglades expansion," said Congresswoman Lois Frankel. "This project means thousands of new good paying jobs for Floridians. It&apos;s a shining example of what we can accomplish when we work in a bipartisan manner across the public and private sectors, and local and state levels." "I am proud to have joined my colleagues in the South Florida delegation to support this vital legislation. The WIIN Act provides much-needed funding to deepen the Port, restore the Everglades&apos; invaluable ecosystem, and ensure a safe source of clean, fresh water for our constituents," said Congresswoman Frederica Wilson. "It really is a huge win-win, pun intended, because the legislation also will create jobs for thousands of hard-working South Floridians." "I&apos;m so proud that with the South Florida Congressional Delegation&apos;s advocacy and many years of teamwork, Port Everglades, which is in my Congressional district, received authorization for more than $335 million in the Water Infrastructure Improvements for the Nation Act (also known as WRDA), earlier this month. This legislation will allow us to take advantage of the expansion of the Panama Canal and receive the larger, post Panamax cargo ships. This achievement will maintain and expand Port Everglades and Broward County&apos;s position as a hub of international trade and commerce. As always, I was thrilled to tour the Port with my colleagues yesterday and see first-hand the results of our advocacy," said Congresswoman Debbie Wasserman Schultz. "This much-needed expansion will pay huge dividends for South Florida in the form of high-paying jobs and economic growth," said Congressman Ted Deutch. "Federal investments like this, together with a thriving and involved business community, will help us compete and win not just against other cities in the United States, but also internationally. Our future is very bright." "After nearly 20 years of hard work, determination, and cooperation between our federal, state and local partners, I am pleased to see the Port Everglades expansion and deepening project moving forward," Congressman Alcee Hastings said. "This project will allow the Port, a vital economic driver in South Florida - seeing over three and a half million cruise ship passengers last year and nearly $30 billion in trade operations in 2016 - modernized to handle the challenges of the 21st Century. As the point of entry for the petroleum and jet fuel supply for South Florida, this project could not come at a more crucial time to support the new, larger post Panamax ships now traversing the recently widened Panama Canal. The ability to accommodate larger cruise and cargo ships means the Port will remain a dynamic economic engine in our region." The Port Everglades Navigation Improvements Project addresses safe shipping requirements as older cargo fleets are being replaced with much larger ships that require wider channels and deeper water. Larger cargo ships currently arrive from Europe and South America lightly loaded and can experience difficulty maneuvering safely when other ships are berthed in some of the Port&apos;s narrower channel areas. The project addresses environmental concerns and will utilize innovative approaches to coral restoration. Broward County has vested interests in its seaport and its sensitive coral reefs as both are major economic generators. Funding for the project will be shared between federal appropriations, revenues generated through Port Everglades customer fees, and grants from the State of Florida. No local property tax dollars will be used. The main features of the project are to deepen the main navigational channels from 42 feet to 48 feet (plus 1-foot required and another 1-foot allowable overdepth for a total of 50 feet), and to deepen and widen the Entrance Channel and parts of the Intracoastal Waterway so that cargo ships can pass safely by docked cruise ships. A key environmental component of the approved plan includes outplanting approximately 103,000 new nursery-raised corals in approximately 18 acres of existing reef areas, and creating roughly five acres of artificial reef by relocating approximately 11,500 corals. At Broward County&apos;s recommendation, the Corps and the National Marine Fisheries Services developed a "blended" plan that includes traditional and more innovative approaches to environmental mitigation. In addition, the mitigation plan includes restoring seagrasses and mangroves in West Lake Park, and building environmentally friendly bulkheads throughout the Southport Access Channel. These pioneering attributes have significantly reduced the project&apos;s environmental impact from what was originally planned nearly 20 years ago. PHOTO CAPTION: Members of the Broward County Congressional Delegation, local elected officials and community leaders gather for a press conference to celebrate the signing of the Water Infrastructure Improvements for the Nation (WIIN) Act by President Obama. As one of Florida&apos;s leading economic powerhouses, Broward County&apos;s Port Everglades is the gateway for international trade and cruise vacations. Consistently ranked among the top three busiest cruise ports in the world, Port Everglades is also one of the nation&apos;s leading container ports and South Florida&apos;s main seaport for receiving petroleum products including gasoline, jet fuel and alternative fuels. The Port Everglades Department is a self-supporting Enterprise Fund of Broward County, Florida government with operating revenues of more than $163 million in Fiscal Year 2016 (October 1, 2015 through September 30, 2016). It does not rely on local tax dollars for operations. The total value of economic activity related to Port Everglades is nearly $30 billion. More than 226,000 Florida jobs are impacted by the Port, including 12,840 people who work for companies that provide direct services to Port Everglades. For more information on Port Everglades, go to porteverglades.net or email PortEverglades@broward.org.